From Istanbul to New York City here are some of the world's most expensive desserts! Serendipity 3 in New York City has the frozen haute chocolate is made from a blend of 28 cocoas, edible gold, Knipschildt Chocolatier La Madeline au Truffles (which sell for $2,600 per lb or $250 per truffle) and comes with a 18K gold bracelet from Euphoria New York. The cost? Only $25,000. 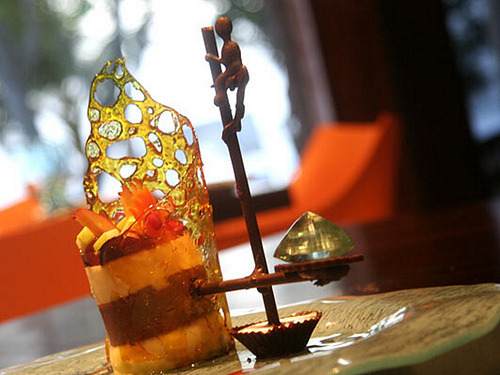 This mango and pomegranate compote has a chocolate fisherman carrying an 80 carat aquamarine jewel. Wine3 Fisherman Stilt Restaurant, Sri Lanka has this $14,500 dessert. 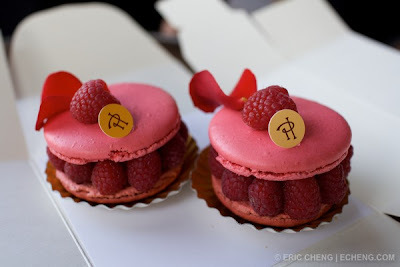 If you're familiar with macarons, chances are you've heard about Pierre Hermes ispahan macaron made with rose, lychee and raspberries. An exclusive meeting with the famed pastry chef to create your own macaron flavor with him starts at $7,414. The final price is determined by the ingredients and quantity purchased. 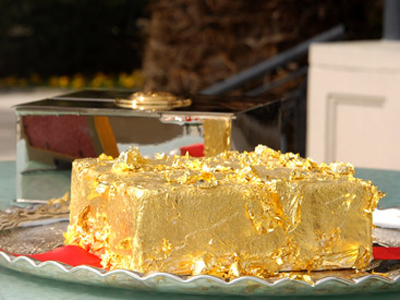 At the Ciragan Palace Kempinski hotel located in Istanbul, Turkey, you can order the Sultan's Golden Cake. This $1,000 golden cake is made with figs, quince, apricot and pears marinated in Jamaican rum for two years, French Polynesian vanilla beans, gold dust. 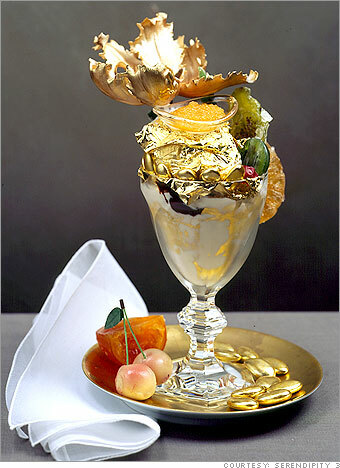 This ice cream sundae covered in 23 carat edible gold leaf, made with Tahitian vanilla ice cream and rare Chuao chocolates from Venezuela, topping made from the world's most expensive chocolate (Amedei Porcelana), gold covered almonds, marzipan, candied fruits and chocolate truffles will set you back $1,000. The Golden Phoenix Cupcake is also made with Amadei Porcelana Chocolate and edible gold leaf but is also made with premium Uganda vanilla beans. 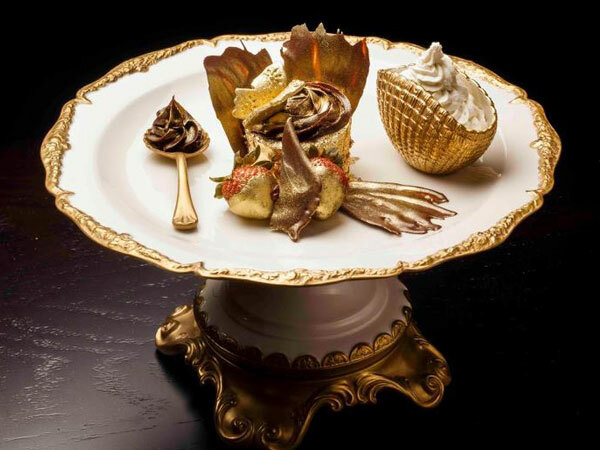 This $1,000 cupcake sits on top of Villari 24-carat gold empire cake stand and gold spoon. If you're interested you'll have to fly out to Bloomsbury's in Dubai. 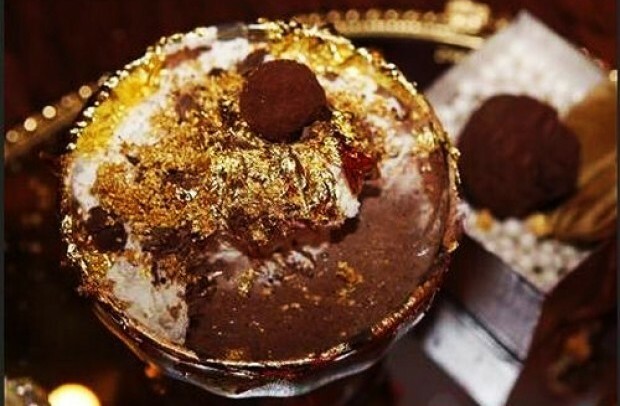 I realize that adorning desserts with gold dust / sheets makes them look so decadent, but what is the point? This will not contribute to flavour, and so ultimately to pleasure, in any way. Such a waste of money. I mean - would you buy these, even if you could comfortably afford them? I agree. There's so many wonderful things in life I could spend that money in...but not on any kinda food, caz it'll end up in the toilet, as you perfectly put it. Thank you for your visit, so glad you liked my stained glass skylight.